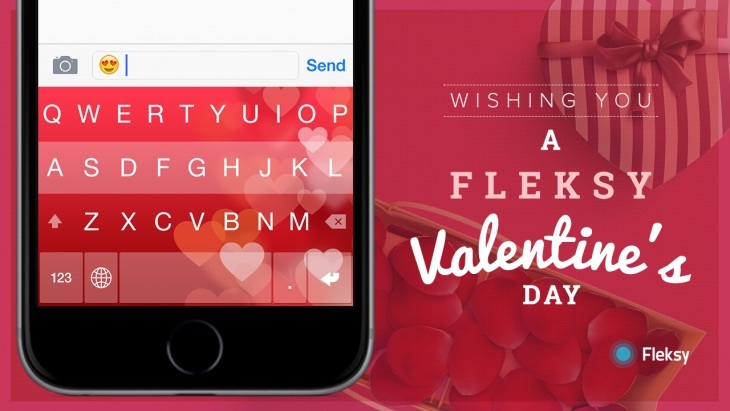 Fleksy yesterday announced an update to its popular, and record-breaking, third-party iOS keyboard that brings along a slew of new customizable Extensions and Themes, including a few that tie in with the upcoming Valentine's Day holiday this weekend. The specific Valentine's Day theme will be free to all Fleksy users on February 14, and Fleksy is also introducing a "Heartpops" extension that animates a colorful heart with every keypress. In the 5.2 update, the company is also making a few broader additions to expand the Fleksy experience. The most notable additions include a new "Energy Theme Pack" with three brand new themes, a Hotkey Extension that allows users to customize a row of seven keys with their own desired emojis, custom phrases or email addresses, and of course general bug fixes and performance improvements. - The Energy Theme Pack! Breathe more life into your keyboard with these animated themes. - The Hotkey Extension! Add a row of customizable keys for things you type often like emojis, symbols or email addresses. - Heart Pops! Make your keys pop with hearts with this lovely Extension. - Magic Button! Replace the globe with emoji, a comma, or a dismiss keyboard button in settings. Also, long-press the globe button for more options. - Case-sensitive layout. Enable this feature in Settings. - iCloud Sync. Now your dictionary words will sync automatically across your devices. - More keys have been added to landscape orientation on iPhone (portrait for iPad). You can disable this layout in Settings. Following the launch of iOS 8 last September and its system-wide support of alternative keyboards, a handful of third-party keyboard apps rocketed to the top of the App Store charts. Fleksy has remained one of the more popular options, with the latest December update bringing a big overhaul to customization options and the introduction of Extensions into the experience. I'm so done with Fleksy, it's not even funny. I feel like I was robbed, and while I value MacRumors, I feel that they promote this product too heavily. I thought up a new name for these posts: Adverticles. But I agree, MacRumors does this too much. I wish they would just be honest and mark them as sponsored content.